The plunge in oil prices is forcing North Dakota producers to cut investments, leading to a slide in the state's oil production. Well, that didn't take long. According to a new report from North Dakota's Department of Mineral Resources, the state's oil production slipped 3.3% in January. That brought daily output from the state's prolific Bakken shale from a record high of 1.23 million barrels a day in December to 1.19 million barrels a day in January. This is clearly a sign of things to come, as producers in the play have dramatically cut back on investments in new wells, which will lead to further production declines throughout the year. North Dakota's oil output has risen dramatically in recent years as a combination of high oil prices and advances in horizontal drilling combined with hydraulic fracturing have unlocked oil trapped in the state's Bakken shale formation. As the following chart shows, oil production in the state has rocketed from minimal to more than a million barrels per day in just the past few years. This has occurred as drillers like Continental Resources (NYSE:CLR), ConocoPhillips (NYSE:COP), Whiting Petroleum (NYSE:WLL), and a host of others have poured billions of dollars into drilling thousands of oil wells in the state over the past few years. These companies had planned to continue pumping greater quantities of oil out of the play before the oil price collapse last year. In fact, ConocoPhillips, as an example, was planning to grow its production from the play by 20% per year from 2013 to 2017, while Continental Resources was planning to use the Bakken to help it triple its production and reserves by 2017. Those plans, however, are now on hold, as low oil prices are forcing producers to cut back on investments in new wells. Continental, for example, has already cut its spending plan twice in the past few months, and now only plans to spend $2.7 billion this year, which is 41% lower than last year, and has cut its rig count by 50% from last year. Whiting, meanwhile, bought its way to the top after acquiring Kodiak Oil & Gas last year and becoming the play's top oil producer. However, the company is now rumored to be looking to sell, as the debt from that deal put the company in a tight spot -- it has already slashed its spending by 50% in order to manage through the downturn. The Bakken has been hit particularly hard by the oil price crash, as there isn't enough oil pipeline capacity to get the oil out of the play and into refineries. That caused oil in the region to fetch an average of just $31.41 per barrel last month, which is almost $20 less than the U.S. benchmark oil price WTI. That ultra-low price has forced producers to simply stop completing new wells, with well completions falling from 183 in December to just 47 last month. Having completed fewer wells, the state doesn't have nearly enough new oil wells coming online to keep up with the production losses of legacy wells. 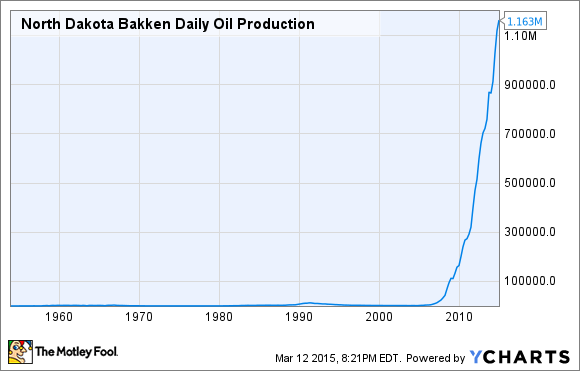 As we see on the following chart, the lost production from those legacy wells has a deep impact on production growth. As that projection from the U.S. Energy Information Administration shows, production from the Bakken shale region, which includes Montana, is expected to see continued declines over the next month. This is due to an expected drop in production from legacy wells of 80,000 barrels a day, which will completely erase the projected 72,000 barrels a day production boost from new wells that are expected to be completed over that time frame. This trend suggests that oil production from the Bakken region could continue to decline for quite some time, as the industry needs a meaningful recovery in oil price before producers start bringing enough new wells online to reverse this trend. North Dakota's oil production has gone from minimal to the second highest rate in the nation in just a few short years. However, the oil price plunge is starting to take its toll on the state's production, which peaked and is now beginning to drop off. It could continue to fall off until there's a meaningful recovery in oil price. While it's anyone's guess when that will happen, the state still has plenty of oil trapped in its tight shale rocks. So while the boom might be letting up, this is likely just a pause in what still appears to be a very long-term upward trend.